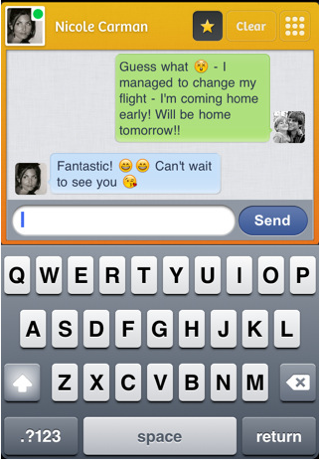 We were impressed by Tap To Chat when it launched late last year, and the new version is even better. This iOS app concentrated on one element of Facebook – chat. Organised in a grid, it allowed you to keep track of, and participate in, multiple chats with your friends and contacts simultaneously. 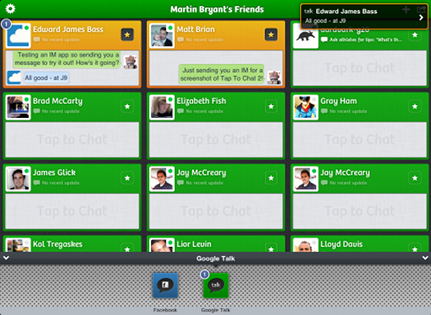 Now the app’s developers have added Google Talk and thrown a bundle of improvements into version two. 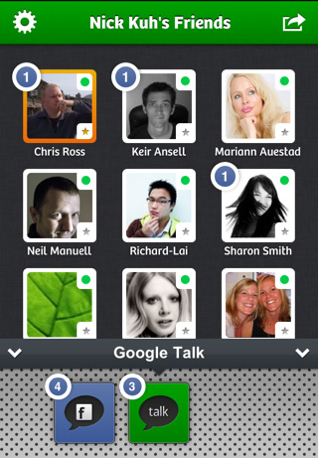 In addition to expanding beyond Facebook to offer Google Talk, the app has been given some beautiful graphical touches. While it’s active, you’ll get Growl-style notifications which pop up in the corner of the screen every time one of your contacts sends you a message or comes online. Tapping these takes you straight to the updated chat, making talking to numerous people at once simple to keep track of. When the app is running in the background, you’ll still get the standard Apple push notifications to keep you in the know. Meanwhile, a range of colour themes have been added, there are accessibility options for visually impaired users (including VoiceOver support) and the whole experience runs noticeably faster than the original app. As with its predecessor, Tap To Chat 2 is a universal app designed to make the most of both iPhone and iPad-size screens. Rather than being a free upgrade, the app is a separate purchase for 59p (or local equivalent), replacing the original version in the App Store. You may balk at this idea, but on it’s not exactly expensive and we’re sure many developers would charge for upgrades if Apple would let them. A free, ad-supported version of the original Facebook-only app is also still available. It would be great to see more IM services added to the app, but if you spend a lot of time running multiple Facebook Chat or Google Talk conversations, Tap To Chat 2 is well worth trying. Find it on the App Store here.